Description: Vanad Varjud is project from Estonia dwelling between different eerie styles as dark ambient/drone/funeral/depressive/black metal that best helps to create atmospheres and ideas Vanad Varjud is fascinated by. At the moment there are three members in this project and Sorts Apostata as the main figure. The idea of creating Vanad Varjud started to form at around 2000. Back then Sorts was involved in very different projects but always fascinated by mystical, dark, deep and calm atmosphere filled with ideas of different and more maybe unsusaul philosophies behind/about human beings without bordering dogmas. Vanad Varjud � the one who takes the crooked path even if it is not the best choice. Interest for such a channel to express, create and explore in Sorts grew and Vanad Varjud as an idea was born. So finally in 2009 circumstances seemed to be right and the Vanad Varjud idea started to become flesh. It took about two years to complete the first recordings and few more years to get them released. The first release called �Apooriad� and it was released by Hexenreich Records. 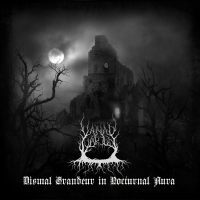 �Dismal Grandeur in Nocturnal Aura� - the second release of Vanad Varjud continues to wander in the same path as in the first release �Apooriad� though maybe in little bit different direction, this time more colder. It is world of eerie atmospheres filled with four journeys to darkness, despair and pain that is binded and may even considered as a somehow story in a key of cold drone depressive black metal.